Our Boiler is a Non-IBR boiler, it can be used in various applications like sterilization of equipment, dry steam for testing purpose, etc. 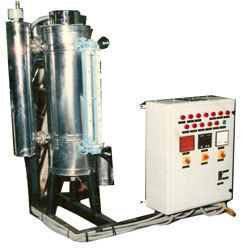 Our bolier can deliver upto 100kg/hr steam. We manufacture Laboratory MiniBoilers that are closed Vessels used to heat water or generate steam for industrial heating and humidification applications and thereby obtain highly pure water. Looking for Laboratory Mini Boilers ?